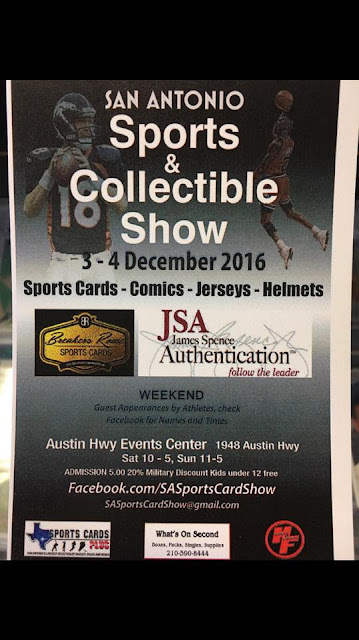 Sports Cards Plus Store Blog: NEXT GREAT CARD SHOW IN SAN ANTONIO IS DECEMBER 3rd & 4th at THE AUSTIN HWY EVENTS CENTER, 1948 AUSTIN HWY. NEXT GREAT CARD SHOW IN SAN ANTONIO IS DECEMBER 3rd & 4th at THE AUSTIN HWY EVENTS CENTER, 1948 AUSTIN HWY. My friends are filling the void for great collectible shows in San Antonio. Although my interests are limited to Sports Cards and Sports Memorabilia, this show will feature some of the state's best collectibles vendors in the areas of Sports, Comics, Coins, Gaming, Knives, Historical and Estate Jewelry. If you collect it, you will find it at this show. Show is located at the Austin Hwy Events Center, 1948 Austin Hwy. -- Saturday, December 3rd from 10 a.m. to 5 p.m.
-- Sunday, December 4th from 11 a.m. to 5 p.m. This is the only show Sports Cards Plus has set up for in twenty years. See www.Facebook.com/SASportsCardShow for more information. Save the date and have some fun.